Conor Oliver and Dave O’Callaghan also crossed the whitewash as Rassie Erasmus’ men produced a commanding display. Cian Bohane and Ian Keatley combined to take down Damien Hoyland. MUNSTER’S SCRUM DID all the damage at Thomond Park, but two first-half tries for Conor Murray set Munster on the road to a bonus point victory. Replacement Conor Oliver scored his first Munster try early in the second-half, while Dave O’Callaghan clinched the fourth in the 57th minute – both scores put on a plate by the outstanding Tyler Bleyendaal. After Chris Dean’s opening try midway though the first-half, Edinburgh clawed to within two converted tries when John Hardie crossed 13 minutes from time, but Rassie Erasmus’ side held solid for the win. Munster lost Jack O’Donoghue to a head injury after 13 minutes, in a n incident that saw Edinburgh lock Fraser McKenzie sin-binned, but it was the Scottish side that finished the sin-bin period celebrating as Dean collected a loose ball from the side of a midfield ruck and cruised home to the corner in the 23rd minute. Munster though, built on early dominance at the set-piece and Murray had a simple task to score as Edinburgh’s scrum back-pedaled in the 27th minute. Bleyendaal’s conversion made it 7-7, and just before the interval a big shove from the Munster eight drove Edinburgh backwards near their own line. The home side forced the knock-on behind the Edinburgh try-line and Niall Scannell popped a pass to Murray to score his second. Bleyendaal had missed an early penalty for Munster, but landed his second conversion to make it 14-7 for the home side at the break. 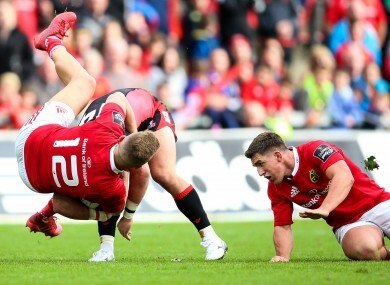 Oliver cantered in Munster’s third try two minutes into the second-half when Bleyendaal carried well into the tackle and then offloaded to the flanker on the left. Bleyendaal was on the mark with the conversion from wide on the left to make it 21-7 for the home side. And from there to the end they bludgeoned their visitors in search of the bonus point. The hosts forced three scrum penalties in a row to force Allan Dell to the sin-bin, which resulted in uncontested scrums. CJ Stander then came close to the fourth try on a couple of occasions, but it came from O’Callaghan galloping through a gaping hole, opened when fly-half Bleyendaal took the ball to the line again. With uncontested scrums, Munster were without their main weapon and had to sweat a little as Hardie’s try gave Edinburgh some hope in the closing stages, but the result wasn’t in doubt. Munster: Ian Keatley; Darren Sweetnam, Keith Earls, Cian Bohane, Ronan O’Mahony; Tyler Bleyendaal (Alex Wootton ’59), Conor Murray (Duncan Williams ’59); Dave Kilcoyne (James Cronin ’58), Niall Scannell (Duncan Casey ’59), John Ryan; Jean Kleyn (Darren O’Shea ’44), Billy Holland; Dave O’Callaghan (Stephen Archer ’65), Jack O’Donoghue (Conor Oliver ’13), CJ Stander. Edinburgh: Glenn Bryce; Damien Hoyland, Michael Allen (Rory Scholes ’72), Chris Dean, Tom Brown; Duncan Weir (Blair Kinghorn ’52), Sam Hidalgo-Clyne (Sean Kennedy ’64); Rory Sutherland, Stuart McInally (Neil Cochrane ’59), Kevin Bryce (Allan Dell ’5); Fraser McKenzie (Lewis Carmichael ’68), Ben Toolis; Magnus Bradbury, Hamish Watson (John Hardie ’25-’33, blood), Cornell Du Preez (Jack Cosgrove ’52) (John Hardie ’59). Email “Murray sniffs out two tries to help Munster claim bonus point win over Edinburgh”. Feedback on “Murray sniffs out two tries to help Munster claim bonus point win over Edinburgh”.